At approximately 5:54 p.m. every Sunday, I do a few things. First, I cover my face in a really intense mud mask, the kind where you can’t actually move your mouth once it dries. (This one, in case you were wondering.) Then, I put on the pair of grandma slippers that senior staff writer Alex Beggs gifted me. (They’re a spa for your feet!) And then, once I’m good and cozy, I CRAVE soup. It literally doesn’t matter if it’s July or February, I always crave soup on Sundays. It may have to do with the fact that it’s so comforting, or that I have a hangover I need to sweat out, but trust me when I say that a bowl of broth-y, noodle-y soup on a Sunday night is the most perfect thing. The problem? That soup craving also coincides with the realization that I spent way too much money over the weekend to justify ordering it on Seamless, which is honestly what I would usually prefer to do. I have to make it. Which is the point where this garlic broth slyly waltzes up and asks to buy me a drink. In case you don’t know me, I’m not the kind of person who has old chicken bones lying around to make stock with, and I’m also NOT leaving my apartment to go get some, which is why this aforementioned garlic broth is so clutch. 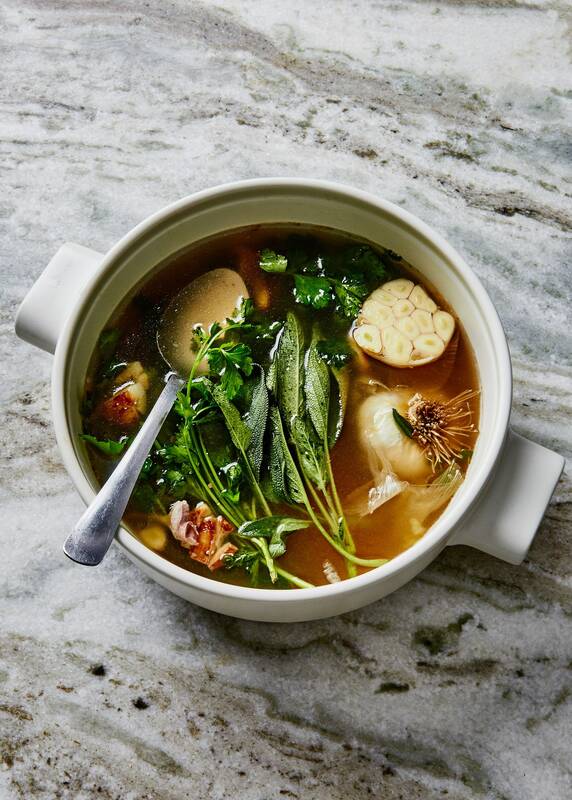 The basis of this broth is just a TON of garlic (2 whole heads! ), but everything after that is up to you. I often add in ginger and scallion, but have done it with yellow onion and celery, too. Got a carrot? Sick! Throw it in. Then I’ll add in whatever tender herb is wilting in the crisper, mostly always cilantro and oftentimes parsley too. When I’m feeling saucy—which, TBH, is most times—I like to whisk a tablespoon of miso and a tablespoon of Sriracha into water to dissolve and then stir that in. It gives the broth a lot of structure and flavor, and makes it look like swamp water! Cool! You let it get all simmer-y while you wash your face mask off, boil some noodles and maybe make an eight-minute egg. I’ll strain the broth, season it with plenty of salt, and then build bowls with noodles, broth, eggs, and maybe a sprinkling of sesame seeds if I’m in the mood. I like to make too much, so I have soup for the week, or freeze it in my silicone ice trays for next Sunday’s craving. Is Sprouted Garlic Safe to Eat? You’ll usually catch garlic before those long, skinny green stalks emerge from the top of each clove; a lot of times you won’t even notice that it has sprouted until you cut into it. And even though those sprouts resemble chives, they doesn’t have the herb’s mild flavor—the sprout itself is actually quite bitter. It’s sharp in flavor, without any of the natural sweetness that garlic should have. But even though the flavor is a little less than ideal, sprouted garlic is fine to eat. TBH, if you’re just incorporating one or two cooked cloves into a larger dish, you probably won’t notice a difference at all. We wouldn’t recommend using sprouted garlic in a dish where garlic is the star of the show—think garlic bread, chicken braised with whole heads of the stuff, or garlic fried rice—but otherwise you’re probably fine. If you’re really concerned, you can slice the offending cloves in half lengthwise and simply pull the green sprout out, but honestly we don’t bother unless we’re using the sprouted cloves raw, like in a salad dressing, which is where you’re most likely to taste the difference. You want only the best garlic when using it raw, so remove the sprout if you’re grating for Caesar dressing. The sprouts are a sign that garlic is starting to go off, mostly because it is getting older, or because it has been exposed to too much heat, light, or moisture—garlic wants to be stored in a cool, dry, and dark place for maximum longevity. A lot of times, you have no way of knowing how long garlic has been sitting in the bin at the grocery store, so it may have already started sprouting before you even got home. Stored properly, garlic can last up to six months as a whole bulb, and around three weeks as unpeeled cloves if stored in a cool, dark place. So make sure to keep garlic in your pantry, and if you end up with some inevitably-sprouted cloves, only bother cutting out those green bits if you’re planning on using them raw (like for Caesar salad dressing). Otherwise, everything is going to be juuuuuuust fine. Now, how about a nice, garlicky roast chicken? Every Friday morning, Bon Appétit senior staff writer Alex Beggs shares weekly highlights from the BA office, from awesome new recipes to office drama to restaurant recs, with some weird (food!) stuff she saw on the internet thrown in. It gets better: If you sign up for our newsletter, you’ll get this letter before everyone else. Aw man, everyone is getting SICK. Stay home! One of the first stories I wrote for BA was about what opera singers do to prevent colds and sore throats, and I’ve been making lemon-honey-ginger tea and warbling like a stray cat in my shower ever since. I brewed pot after pot this week, hoping to ward off the germs. To really double down on cold prevention™, I also made a batch of Chris Morocco’s garlic broth in my Instant Pot, which is sort of a silly thing to do because it takes just as long to make as it does on the stove when you factor in pressurizing time. But it seemed like a good idea at the time. I added a Fresno chile, ginger, and then whisked some egg in, stracciatella-style. Staffers Emily Schultz and Sasha Levine also made the same recipe this week. Emily doctored hers up by adding in a slurry of miso + water, ginger, scallions, spinach, and udon. Sasha drank hers with tons of flaky salt. Whether or not we’ll be able to defeat the common cold has yet to be determined. Vampires on the other hand, we haven’t seen them around these parts for days. That was Ryan Walker, assistant to editor in chief Adam Rapoport, giving directions to the Hot 10 Party this week, smack in the middle of Brooklyn. Inside, a crowd of 1,200 (I didn’t count) ate bites from all of this year’s winning restaurants, as well as some returning alumni like Chef’s Table star Cristina Martinez of South Philly Barbacoa. Contributing writer Priya Krishna overheard a partygoer say: “I went to Pilates before this—it better be worth it.” I hope it was, Pilates lady!! Molly Baz was confronted by strangers skipping any introduction, demanding to know: “Where’s Brad?” At home with his babies! Someone asked Alex Delany if he was Alex Delany. Yes, yes he is. “Well I’m Nick Delany,” he continued, “and my brother’s name is also Alex Delany, and he HATES you!” So we’d like to take this moment to apologize to artist Alex Delany, who wants nothing to do with Bon Appétit, which is totally understandable. Sorry Mr. Delany! THE FOOD. I beelined for Maydan’s melt-off-the-bone lamb shoulder on a creamy tahini sauce with a puffy soft triangle of pita. The very long line for Yume Ga Arukara’s udon was worth every minute. Nyum Bai’s prahok ktiss filled the room with the scent of fish sauce and pork, which made me happy as much as it amazed me—how much flavor was packed into a bite that fit in the palm of my hand! I spotted Christina Chaey pop a perfect cylinder of Nonesuch’s seared daikon into her mouth like it was a peanut M&M. THAT’S THE LAST PLUG I’LL DO FOR YOU, KNOWLTON! “I’ve been trying to get a Bloody Mary all day.” “I want an enormous Bloody.” “I want aioli.” “I’m making CACIO E PEPE for dinner.” “I want a boat of French fries.” “I want a big Italian sando.” These are just a few of the notes I took when staffers with faded after-party stamps still on their hands trickled into the office, groaning. For those of us who skipped the after-party, preferring sleep and solitude, we apparently missed a drag queen who makes fantastic babinka based on her grandmother’s recipe, obscene scoopfuls of caviar, and Pet-Nat in branded solo cups. Sounds about right. has been updated. Apple designers added some jiggly-looking cream cheese to placate the angry hoards. Still oddly unappetizing, but maybe that’s because the bagel’s dimpled texture reminds me of parts of my body better left unmentioned. “I’m just not a yeast girl,” Christina Chaey lamented, while we ate her slightly dense (due to old, possibly DEAD, yeast) rendition of Claire’s apple coffee cake. It was still amazing. The thinly sliced apple topping is divine—especially with lemon-ginger tea. What appetizers does a cocktail party need? The test kitchen argued over what to serve to our Hot 10 chefs at a gathering in the office on Tuesday. Molly ended up making kimchi dip, artichoke dip (yes we already bothered her for the recipe), and nutritional yeasty popcorn. But for some reason Chris Morocco wanted larb. He even ordered the ground pork for it! “Was I supposed to make it?” Molly wondered when Chris SHOWED UP TO THE PARTY THREE HOURS LATE. “Chris has this ability to put a spell on us,” Andy Baraghani explained, “As a witch, I’m impressed.” So to mess with him, the food team Slack group chat pretended to be inundated with work while Chris was out shooting a Christmas cookie story, begging him to return to help them cook for the crowd. CHRIS RESPONDS: “I was punked so bad! Instead of seeing some of the best chefs in the country commenting on our brave and visionary inclusion of larb with the other appetizers, I saw bricks of raw meat stacked in the walk-in and bottles of natural wine being drunk like hipster Gatorade, while I was carting Alex Lau’s computer across town.” Excuses, excuses! On the most recent episode of the Bon Appétit Foodcast, which was devoted to all things garlic, editor in chief Adam Rapoport declared there was one mistake in our recently published garlic primer from the October issue. The Garlickiest Fried Rice, he explained, was definitely one portion—not four. His exact words: “I would house that plate.” Having made it myself, I can safely say that while he is technically incorrect, he is not wholly out of line. I had to apply some serious self restraint in order not to do exactly that. You start by making crunchy, golden, fried garlic chips, a pure genius condiment—seriously, just try not to eat them all the moment you pull them from their hot, glistening oil. But Andy Baraghani, a very smart man and the mind behind the recipe, knew their purpose was twofold: To be an addictive topping with countless applications beyond this particular dish, and a necessary byproduct on the path to a garlic-infused oil used to cook everything else that goes in the dish. This way, garlic makes its aromatic, slightly spicy way into every single bite, taking the recipe from garlic fried rice to the garlickiest fried rice. So good, you could eat ’em straight. After the chips, you’ll sauté some ginger, scramble an egg, then dump some day-old, dried-out rice into the pan. (Those adjectives are important: “day-old” and “dried-out” mean the grains get properly crispy.) Toss in some scallions for bite, which will wilt and mellow just enough, and then lay it all out on a platter. Your work here is done after a scattering of chopped cilantro (for freshness), toasted sesame seeds, and, of course, the fried garlic chips. We won’t tell if you cancel plans and feed yourself straight from the bowl. If you eat salad for the croutons and tomato soup for the grilled cheese, you should be making garlic chips… to put on everything. These thin-sliced pieces of heaven crisp up in minutes and add a nutty, garlicky crunch factor to rice, stews, salads, and really anything at all. Making them is incredibly easy, if you have a mandoline. (And if you don’t—get one. We like the Benriner Japanese mandoline.) It’ll slice the cloves more evenly and thinly than your chef’s knife—just watch your fingers! Keep in mind too that this is not the time to use your favorite olive oil. We use a neutral oil like vegetable or grapeseed because, 1) you want the favor of the garlic to shine through, and 2) you want the garlic chips to be versatile—olive oil may be great for topping aglio e olio, but it doesn’t complement soy sauce and sesame oil as well. 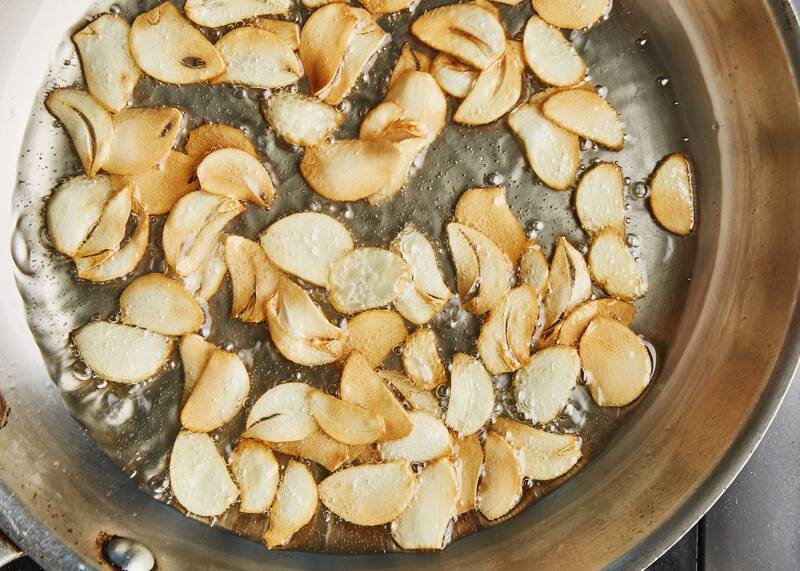 Mandoline + garlic = perfect chips, every time. Crispy garlic chips happen pretty fast, so keep your eye on the prize. You start the garlic in cold oil so it comes to temperature evenly, and you’ll know the chips are done when the oil stops bubbling around the edges and they turn slightly golden. Be conservative here and pull them out as soon as they hits a light golden-brown. It will take time to fish out each sliver with a slotted spoon, so work fast and in batches. Nothing tastes sadder than bitter burnt garlic. 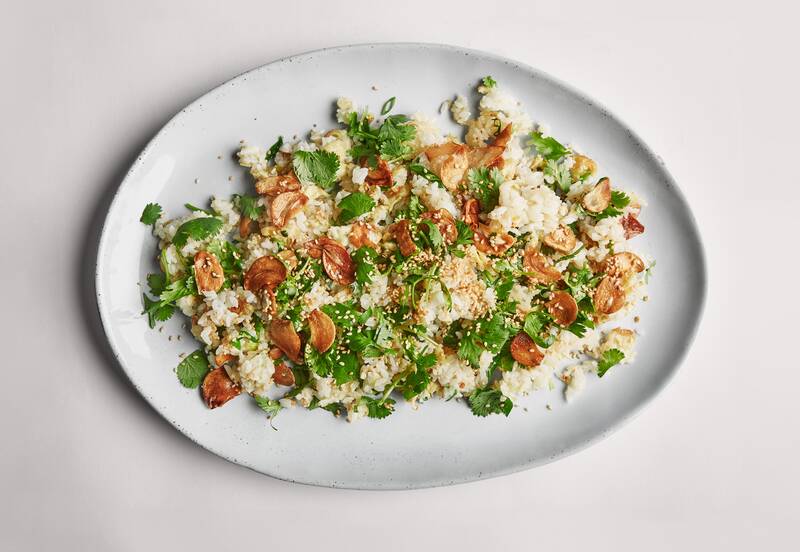 Check out the crispy, crunchy garlic chips on this garlicky fried rice. Once you drain them on a paper towel, they are a nice little sweet, slightly nutty, and garlicky topper. They are best still warm and scattered atop the aforementioned fried rice, ricotta toast, seared steak or short ribs, weeknight pantry pasta, etcetera, etcetera, etcetera. They can be kept in an airtight container for a few days, so grab a few extra garlic heads and make a double batch. And while you’re at it, maybe consider investing in an extra tin or two of mints? The hands-off method for slow-roasting fish in the oven is tried and true for me. Instead of babysitting a piece of salmon on the stove, I can slide it in the oven for about half an hour and it will poach in olive oil and aromatics until tender, flaky, and never dry. But when fall temps hit and I start to crave comfort food, I’m gonna make our new recipe for halibut and fennel cooked in garlic cream my go-to. Cooking in two pints of cream sounds insane and decadent, because it is. The result is effectively a carbless chowder (fennel subs in for potatoes) that’s filling without weighing you down. 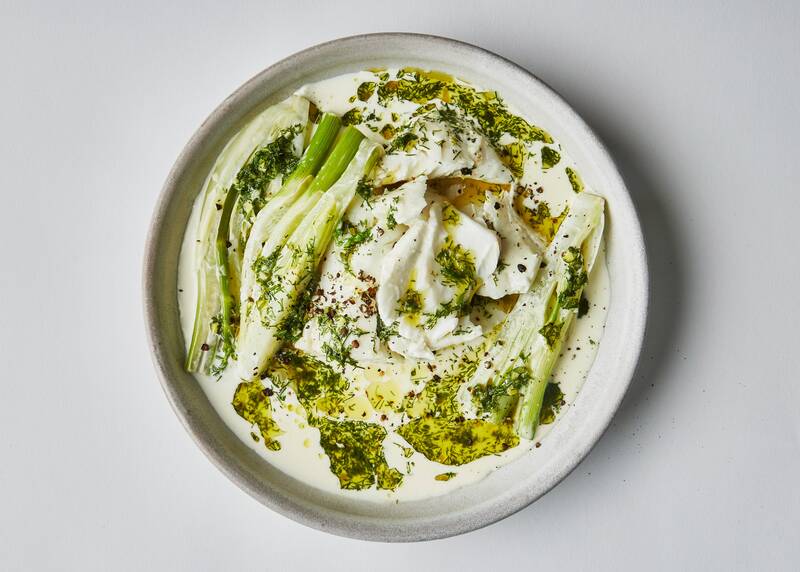 The slow-cooking cream helps melt away the sharp edges of eight cloves of thinly sliced garlic and bulb of anise-y fennel that go with it, all while keeping the fish tender at the same time. And it only takes about 20 minutes. The best part is that you can choose your own adventure when it comes to the garlic-infused goodness: Go for a little drizzle over the top of the filet, or ladle on a lot to make yourself more of a soup (highly recommended if you’ve had a day). A condiment of an entire lemon (zest + juice), fennel fronds, olive oil, and black pepper goes on top, adding a punch of fresh, bright flavor that cuts through the fat. Just make sure to use a neutral-tasting olive oil (I made mine with super peppery version and it threw things off balance). I served my halibut over polenta to make it taste kind corn-and-fish chowder. Ideally you should make this for a group and not have any leftovers (I ate mine over some leftover polenta—also slow-cooked in the oven!—to emulate a fish-and-corn chowder vibe), but should you find yourself with remains, you’ve got options. Senior food editor Andy Baraghani, who developed this recipe, suggests straining the cream, heating it up over low in a large skillet, and letting it thicken slightly (simmer, not boil—it will break!) before dropping in some cooked pasta. Wham: you’ve got a garlicky, cheeseless alfredo sauce (save a little pasta water in case you need to thin it out). Eat it as is, or top with some reheated fennel and flaked halibut. For an even bigger upgraded, you can make a quasi-brandade (a.k.a. salt cod spread) by combining whipped boiled potatoes with the fish, cream, and a bit of olive oil, broiling it, and then spreading it all on toast. That’s dinner one night, and a party appetizer the next. It’s rare to make fish that you want to eat for multiple meals, and maybe my doctor wouldn’t recommend eating this much garlic cream. But after a long day, knowing that I can make a comforting dish in half an hour and have repurposeful leftovers is a win-win. Let’s just say I can’t wait ‘til it’s cold.